We’ve all heard of gold rush prospectors, but how about bio prospectors? 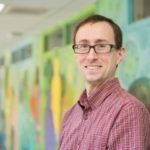 Jeffrey Gardner, Assistant Professor in the Department of Biological Sciences at the University of Maryland Baltimore County, explores how we can find better ways to make the products we use today. Our lab is focused on understanding the metabolism and physiology of bacteria, specifically how they sense their environment and obtain energy. We use the soil bacterium Cellvibrio japonicus to study how microbes in the soil detect and degrade plant cell walls. Our lab uses the interdisciplinary approaches of molecular genetics (transcriptomics), classical bacterial genetics, and biochemistry. By uncovering the mechanisms of plant cell wall degradation by bacteria we hope to (1) determine how bacteria are able to sense plant cell walls as nutrients, (2) understand how the degradation of plant material is regulated, (3) elucidate unknown gene function in the context of plant cell wall degradation, and (4) engineer useful properties into bacteria that may have industrial applications. enzymes that degrade polysaccharides, so how do you find which ones are the best? biodegradable plastics, and even poultry feed. Discovering and characterizing enzymes from nature that have uses in biotechnology or medicine is called bio-prospecting. In order for enzyme bio-prospecting to be effective, many types of bacteria need to be studied, so this type of research not only provides an opportunity to make better consumer products, but also helps us understand the natural world.